Philips just teamed up Kvadrat Soft Cells to unveil a brilliant new breed of luminous wallpaper that could forever change the field of mood lighting. The beautiful textile combines sound-absorbing properties with LED lights to cast a colorful low-energy glow over any interior space. 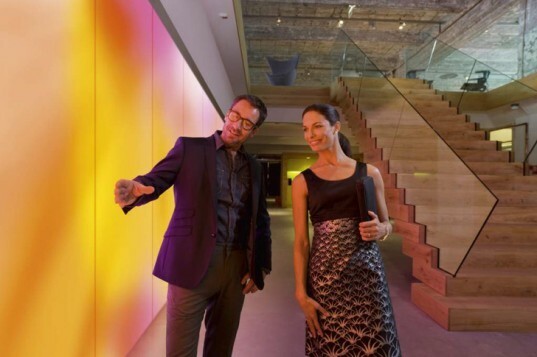 The walls are capable of displaying a broad range of LED color and they’d certainly tickle Willie Wonka’s fancy (although they’re not lickable!) 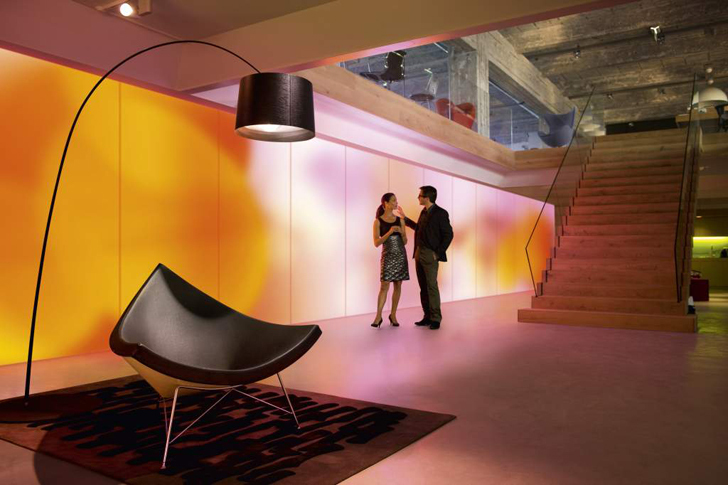 The spectrum of light is perfect for creative environments for the hospitality industry (think hotel lobbies and restaurants), adding ambience, décor and light with just one product. The enveloped environment is further enhanced by Kvadrat’s unique sound absorbing panels. Echoes are softened, and noise diffused thanks to the integrated soft cells. Restauranteers and lounge owners will benefit from a unified product that helps create customer intimacy through its visual and auditory characteristics. The innovative textile is held in place with a lightweight aluminum frame that keeps it taut with the perfect amount of surface tension. The LED lights are available in a wide palette of colors, allowing the user to change the mood or color of the room whenever desired. We can already picture the illuminated walls in the swankiest bars, restaurants, hotels and fashion forward homes. Redecorating would be a cinch since a room’s lighting and color could be easily changed at a moment’s notice. The idea is beautiful. I do wonder if you can still hang posters, paintings on them as well. Other than that - the reduction in materials is a plus. Hopefully they will be affordable and easy to maintain (in case a bulb goes out). They are awesome looking. YUMMY! Hope it will be affordable and make me look as great as these people in the ad! I love the idea of the color changing walls. This way it's going to be easier to redesign a room because we don't need to paint the walls again, or taking off the old wallpaper and putting on a new one. So, this way we don't only save time and money, we also help taking care of our planet by reducing the amount of wallpaper and paint used in interior spaces. I'd love to see these shining walls not only in hotels and restaurants but in our homes too.